Remove the instrument side finisher RH using a suitable tool. Remove the glove box assembly upper screws (A). 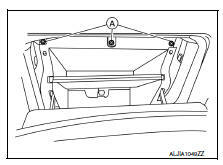 Disconnect the harness connectors from the trunk switch and glove box lamp, then remove the glove box assembly.